Popular blogger Lauren Casper shares poignantly simple yet profound wisdom about removing the barriers we construct around our hearts and doing life full-on, all from the least expected source: her five-year-old son, Mareto. For Lauren Casper, living with her five-year-old autistic son, Mareto, is a lot like playing the telephone game. He blurts out little phrases that have their origin in something he saw or heard, but by the time they make their way through his mind and back out of his mouth they’ve transformed—often into beautiful truths about living a simple, authentic, love- and joy-filled life. Mareto has a number of mantras, scripted phrases he says over and over. They seem silly at first, but as Casper has thought about them over time, she’s realized he is actually sharing important life lessons. From “it’s okay about it,” a simple reminder that even when things are painful or difficult, things will be okay because of the God who promises never to leave or forsake his children, to “you’re making me feelings,” which teaches the importance of leaning into one’s emotions and, in doing so, sharing a piece of oneself with loved ones—Mareto’s simple yet profound wisdom is a reminder to embrace the broken beauty of life, to believe in a God bigger than human comprehension, to love others even when it doesn’t make sense, and to find joy in unexpected places. For all those looking to recapture the faith, simplicity, wonder, hope, courage, and joy of life, It’s Okay About It provides a guide to look inward and live outward, to discover the most wide open and beautiful life possible. This is such a great read! 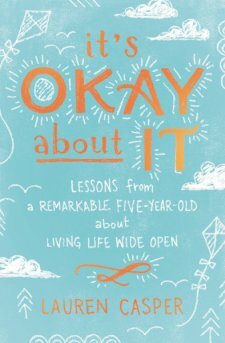 "It's Okay About It" is perfect for any parent or those who are about to be a parent. I love this book. Isn't just about a five year old who has Autism, although you will find such a beautiful and unique God story, you will find yourself looking beyond a label. This book will help you see beauty even when things are hard, especially in the everyday. I love how the small things are the big things that matter the most. This book will bless you in so many ways, I cannot describe. I highly recommend picking up a copy. I was moved to tears, I was happy and most of all, I found myself thinking of every single person who needed a copy of this book! You will love the fresh perspective this book gives. And if that isn't enough, Mareto's little one liners, are enough. I give this book 5/5 stars. Thank you to the publisher for providing me a complimentary copy for a review. A favorable review was not required. Lauren Casper is the founder of the popular blog laurencasper.com, where she shares her thoughts on life, parenting, and faith. 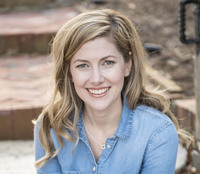 She is a top contributor to the TODAY Parenting Team and has had numerous articles syndicated by The Huffington Post, the TODAY show, Yahoo! News, and several other publications. She also has the joy of serving on the Created for Care team, a nonprofit ministry dedicated to serving foster and adoptive families. Lauren and her husband, John, have two beautiful children adopted from Ethiopia. They make their home in the Shenandoah Valley of Virginia. I ink this will be a great book for my book shelf. Sounds like a good read. Oh, this is another book I might need to get my daughter for Mother's Day.